…as a group from Continental AutoSports stood around watching. There were some obvious side bets going on as to whether I was actually going to get into the little race car, while others questioned if I was going to drive it on the street. Kismet, fate, I had been at Road America only a few days before this drive, and I had seen another little Ginetta. 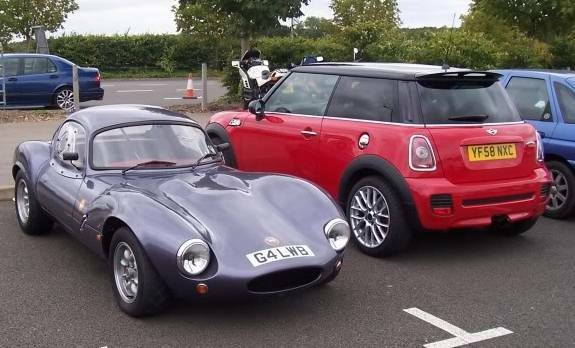 Scarce as hen’s teeth, they have a presence few other cars can match, and walking around the diminutive machine, I couldn’t help compare the beautiful lines to the Porsche 904 or to Shelby’s Cobras, both of which are bigger. 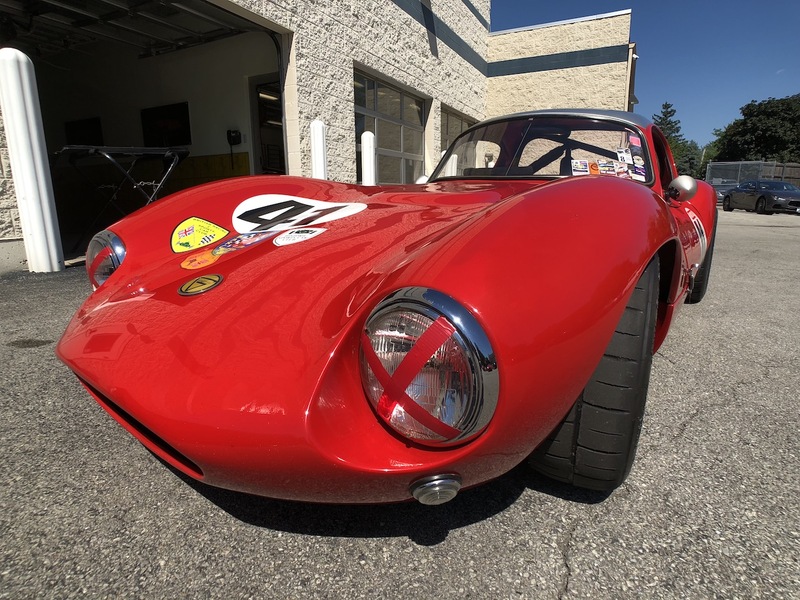 Founding in 1958, the owners, four brothers, busily turned out their little race/road machines to a niche market interested in speed and durability for motorsports events. Their little racing cars terrorized tracks in Europe, regularly beating cars with larger engines through a combination of chassis design and low weight. Unlike the G1-3, the G4, or fourth series, was designed for both the track and road, retaining the fiberglass body and perspex rear and side windows to keep it lite. 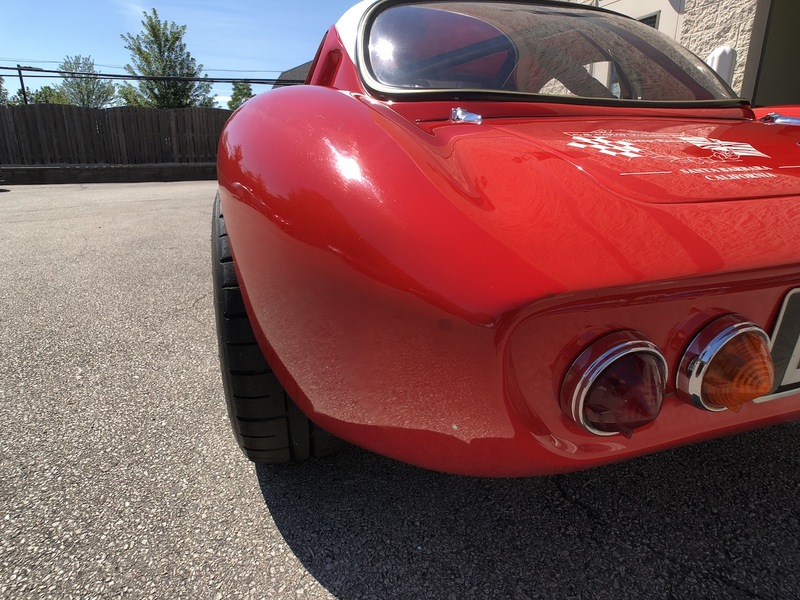 This particular 1963 Ginetta G4 has been set up for vintage racing, and though frightening fellow motorists on an early Sunday morning would be fun, this car longs for vintage racing, club events or lapping days. This Ginetta G4 weights only 1000 pounds, is now powered by a 1600 all steel Lotus twin cam, and has been dynoed at 209.8HP @ 7300rpm. I’ve done the math for you and that means predicted 0-60 time of about 3 seconds. Driving this Ginetta, it feels every bit of being in a serious race car. Flip the ON switch, hit the START button, and the G4 roars to life, conveying more the feeling of a WW ll aircraft than a race car, and much more exciting than any modern day machine I’ve been in lately. Around the parking lot a for a few minutes, I quickly learned about a dog-geared transmission. Dog engagement is normally used in racing cars where very fast shifts are necessary. 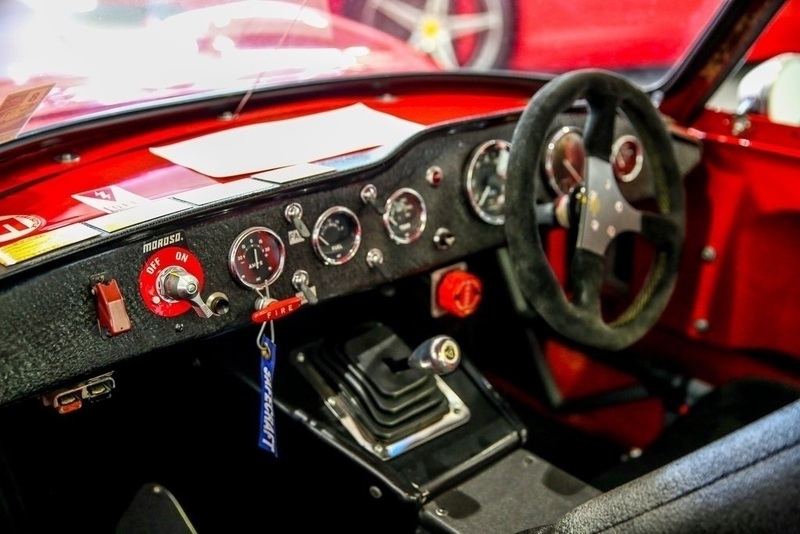 Unlike double de-clutching, this type of setup means blipping the throttle to match engine revs, then quickly finding the next gear, without the necessity of pushing in the clutch. How fun! Dog gears, I found out later, have huge teeth on the transmission mechanism and due to their design, let’s you bang away at the shifter. Lacking civility in any aspect, the Ginetta G4 has lunging acceleration and hold-on-to-your-liver cornering. Less than modern braking means planning your deceleration, but that’s half the fun of the vintage driving, and everyone should have a go in a machine like this just to be reminded that infotainment systems and ApplePlay don’t always make for a better experience. Available at Continental AutoSports in Hinsdale, IL., stop by for a look, and tell them I sent you.